Are You Making These 4 Silly Writing Mistakes? As a freelance writer, there is a good chance that you have several bones to pick with editors, clients, blog owners and publishing houses. You might think of them as the people put on this Earth to make your life miserable by rejecting your work and constantly asking for additional edits and rewrites. As true as it may be that some editors are just too demanding, sometimes, you as the copywriter, might be your own enemy. The way you speak and the way you write cannot be the same. There are some common writing mistakes that we all make; mistakes that dilute the quality of our work in the long run. 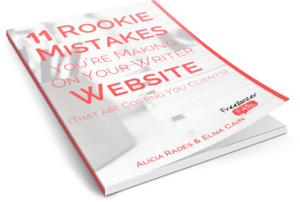 They might come about as a result of a bad freelancing habit, poor training or just something you picked up along the way and never took the time to correct. Think about it, aren’t there some words that you simply cannot spell right? At least not on the first go. Along the way, you picked up those words and made it your sole mission to learn how to spell them even when you are under deadline. It is those sort of things; those sort of mistakes that could be holding back your writing career. Are you making these silly writing mistakes? Granted, the grammatical realm of writing is quite wide. Mastering every single rule of writing in English can be quite challenging, considering the fact that you still have to write in a style that suits your audience. To be safe, it is often best to master the essential of grammar before you can go about playing with the rules. Never mess around with verb tenses, learn the difference between words that sound similar but mean different things based on their spelling (for example, complement/compliment). Learn how to punctuate your sentences properly, and most of all learn how to sound natural. The way you speak and the way you write cannot be the same. But both still have to sound natural. There are different grammar checker tools, like Grammarly, that you can use to check and improve the quality of your article. As a blog writer for hire or a ghostwriter, you will quickly learn that writing without a plan often means ending up with disjointed content. Your writing needs to have a smooth flow to it. Your readers should be able to follow you from start to finish without struggling. This can only happen when you plan well before you write. Otherwise, you will very likely rumble on and on about nothing in particular. We all suffer time constraints. If it is not a looming deadline, then it is a mental target you have for yourself. Either way, there are a lot of times when you find that you may not want to review your work because you want to move on to the next project as quickly as possible. Reviewing your work gives you a chance to pick up on the tiny mistakes you may inadvertently make when writing. It will give you the opportunity to see whether or not your work has the right kind of smooth flow that is needed. A lot of freelance writers proofread their own work. As much as editing and proofing your own work reduces the number of silly little mistakes one can make when writing, it doesn’t really protect your writing from its, ironically, number one enemy – you. Writers tend to be blind to their own mistakes. There could be a grammatical mistake you have been making ever since you started writing. To you, it is not a mistake because quite frankly, you do not know any better. By proofing your own work, you will be overlooking the very same mistakes thinking that everything is okay. Give your pieces to a fellow writer or a trusted colleague to proofread and give honest feedback. Learn to write regularly to get better at what you do. Always follow the guidelines and instructions and no matter how good you think you are, take the time to read content from other writers and to learn new ways to express yourself. This will refine and significantly improve your writing. What Should I Do if I’m Going to Miss a Writing Deadline? Mercy Mmbone is a full-time professional freelance writer who has the determination, skills, and passion to not only meet, but exceed clients’ expectations. She has contributed to Ring Central and also runs her own blog, Writing Doozy. Helping others achieve their goals is her top priority. Mercy is simply amazing! I recently hired a copyeditor to go over my digital marketing content and I’m so happy with that decision. It’s wonderful to have another pair of eyes look over your work! You made the right decision, congrats! Even the best writers miss a misspelling or comma splice from time to time. It’s so easy to overlook mistakes when you’re proofreading your own work, and that’s why hiring a second pair of eyes is a good choice to make. Awesome piece! This sort of content is very important to talk about, and I applaud you putting in the time to write about it. I shared it with my followers and they really loved it as well. Hope to be learning more from you soon!